Visitors to the Wisconsin Breeding Bird Atlas Final Kickoff this April will have the opportunity to learn from (and maybe even hoist a beer with!) Ian Davies, one of the “Big 4” coordinators at eBird. Arguably one of the most prolific birders in the world, Davies has trekked to 45 countries in his search of birds, observing nearly 5,000 species and photographing more than 3,000 of those along the way. You may also recognize his name from the 700,000+ warbler day (https://ebird.org/view/checklist/S46116491) he had in Quebec last spring. Davies will be the keynote speaker at the meeting April 5-7 at the Holiday Inn & Convention Center in Stevens Point. The WBBA II Final Season Kickoff carries the subtitle “Gearing Up for the Home Stretch” and is seen by Atlas organizers as pivotal to marshalling the state’s volunteer atlassers to focus on those priority blocks that need work in the fifth and planned final season of field work. Davies says he started birding at the age of 12, after a visit to a banding station at the Manomet Bird Observatory in Massachusetts. “I released an adult male Canada Warbler, and I’ve been lost to the feathered world ever since,” he says. Davies turned his passion into a full-time job when he landed at the Cornell Lab of Ornithology. As the eBird Project Coordinator, one of his jobs is to work with WBBA II coordinators Nick Anich and Ryan Brady. 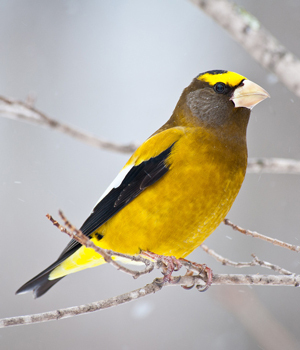 With $75,000 in funding from the Wisconsin Society for Ornithology, WBBA II became the first breeding bird atlas to be administered through eBird. Davies works closely with coordinators to create new tools to make data collection and analysis easier, tweak existing tools and help with questions about data and eBird. As the inaugural project, Davies says Wisconsin has “set a high bar” for all future breeding bird atlases. “The results from Wisconsin atlasers are incredible. We had hoped that eBird would make it easier for folks to atlas, but having more data than the entire last atlas in the first year? Amazing!” he says. Since WBBA II started data collection in 2015, two more eBird atlases (Virginia and Maine) have commenced, and New Zealand and New York will begin in the next year. Davies says his team is excited to explore how eBird can support methods to tie data together across regions to gain insight into species across broader scales, like with eBird’s new Status and Trends capabilities (https://ebird.org/science). Such big picture thinking is part of Davies’ job. “I also get to collaborate with folks around the world, which could be anyone from local data-quality reviewers to governmental agencies — always doing what I can to maximize how eBird’s resources can help the birds and communities in the region,” Davies says. He also manages eBird translations, coordinates eBird Mobile app development, and writes content for eBird’s homepage and social media channels. Despite having birded around the world, the Badger State is still foreign territory to Davies. He says he’s looking forward to a “lifer,” and obviously can’t leave without a beer and cheese experience. Attendees at the WBBA II Final Kickoff can catch Davies’ address “WBBA II: The Future of Atlasing in the Era of eBird” at 8 a.m. on Sunday, April 7. The weekend will include field trips, training for established atlasers and newcomers, eBird workshops and tips from the experts. It will also be an opportunity to set personal strategies on how and where volunteers can best help the project to coordinate finishing in 2019. A Birds & Beers social event at Central Waters Brewpub and morning and nocturnal field trips to look for species like Greater Prairie-Chickens and Snowy Owls will round out the weekend. Advance registration for $30 (which includes breakfasts, snacks, Saturday lunch, all sessions, and field trips) must be completed by March 15, though walk-ins are welcome for $40. Agenda and full registration details can be found on Pages 13-15 of this newsletter and at https://wsobirds.org/atlas-2019-kickoff. A total of 18 presentations will be offered, beginning with an optional “Atlasing 101” session on Friday afternoon, and running through noon on Sunday. Topics range from an overview of project results to date, how-to tips for uncovering secretive species, and a Q&A session. As the project heads into the final breeding season, strategy regarding when and where to Atlas will underscore many of the topics discussed. A job-fair style session will feature county coordinators at tables by region to help match atlasers with the right blocks that still need to finish.